It's probably safe to say that you're not a fan of roaches, ants, and other pests. To make your property pest free, Arab Termite & Pest Control provides comprehensive services. We use proven methods to safely exterminate all types of insects, which makes your home a safer and more sanitary environment. Don't be oversold or over-serviced. Arab Termite & Pest Control provides honest, friendly. trustworthy service for most common household pests. 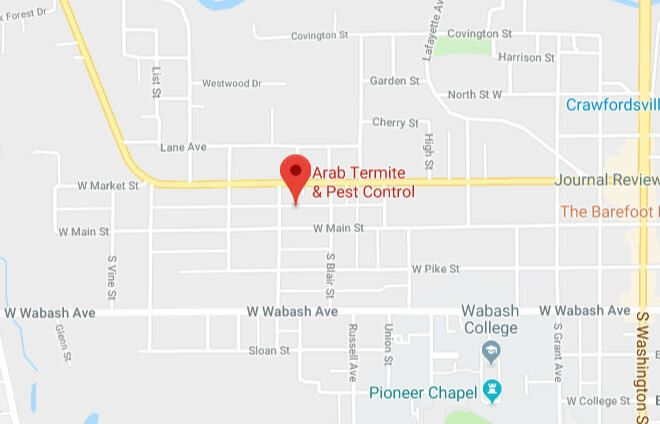 Eliminate all types of pests from your property with pest control from our company in Crawfordsville, IN. We provide you with effective solutions for your specific insect or rodent problem. Whether you need a one-time treatment or scheduled service on a monthly or quarterly basis, depend on our professionals to meet all of your pest management needs.